Rafale Deal: "We already have 30 partners other than Reliance," Dassault CEO Eric Trappier said. 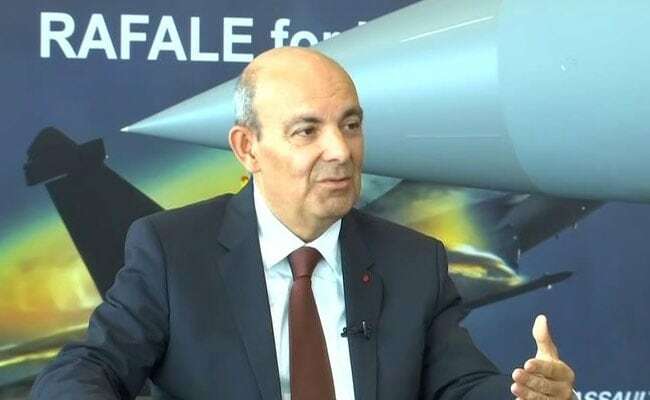 Rafale Deal: "We chose Ambani by ourselves," Dassault CEO Eric Trappier said. Diving into the political back-and-forth in India over the Rafale jet deal, French plane-maker Dassault today put out a detailed rebuttal of Rahul Gandhi's allegations of "lies" and corruption in its tie-up with companies in Anil Ambani's Reliance Group for offset contracts. "We chose Ambani by ourselves. 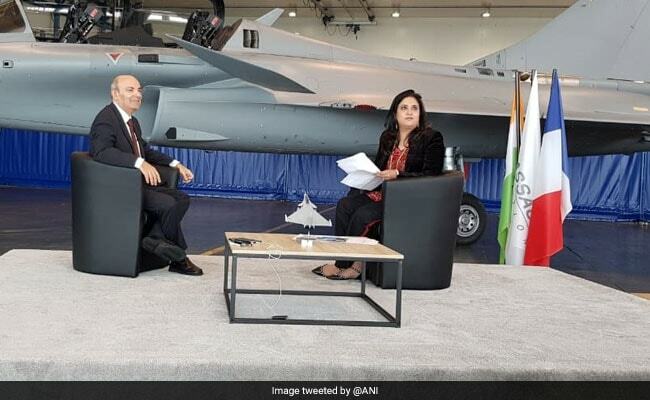 We already have 30 partners other than Reliance," Dassault CEO Eric Trappier told news agency ANI in an interview against the backdrop of a Rafale jet parked in a hangar at Istre- Le Tube airbase in France. The CEO countered the Congress president's allegation that Dassault, in order to bag India's Rs. 59,000 crore order for 36 Rafale jets, chose Anil Ambani's Reliance Defence as an offset partner despite its inexperience in the field, and then lied about the contract. "I don't lie. The truth I declared before and the statements I made are true. I don't have a reputation of lying. In my position as CEO, you don't lie," he said. The interview comes before the Supreme Court takes up the government's written explanation on its decision-making process and pricing details tomorrow. The Dassault CEO also responded to opposition allegations that the government dumped a deal negotiated by the previous Congress-led UPA government and went with a not-so-favourable one just to help one company. The UPA government had been in talks for 126 Rafale jets, of which 18 were to be supplied in a fly-away condition and 108 were to be manufactured in India along with state-run Hindustan Aeronautics Limited (HAL). "The price of 36 was exactly the same when you compare with 18 fly-away. 36 is the double of 18. So as far as I was concerned, it should have been double the price. But because it was government to government, there was negotiation, I had to decrease the price by 9 per cent," he said. The offset clause meant that in exchange for landing the Indian contract, Dassault has to invest half the value of the deal - about 30,000 crores - in Indian firms. Reliance Defence was chosen as one of those "offset" partners and is to manufacture plane parts - though not for the 36 jets ordered by India. On the breakdown of talks with HAL, Mr Trappier said: "It's because the 126 didn't go smooth that the government of India had to reconfigure to urgently acquire 36 from France. And then I took the decision to continue with Reliance, and HAL even said in the last few days that they were not interested to be part of the offset. So, it has been done by my decision and the decision of Reliance to invest in a new private company." Mr Trappier said the money being invested was not going to Reliance directly but into a Joint Venture that included Dassault. "We already have 30 partners other than Reliance," Dassault CEO Eric Trappier said. "We are not putting the money in Reliance. The money is going into the joint venture. I put my know-how free of charge on how to produce people. I have engineers and workers from Dassault who are taking the lead as far as the industrial part of this deal is concerned. At the same time, I have an Indian company like Reliance who is putting money into this JV as they want to develop their country. So the company is going to know how to produce aircraft." The Dassault CEO's clarification comes days after Rahul Gandhi, flagging a report by news portal The Wire, alleged that the French plane-maker invested Rs. 284 crore in a loss-making company promoted by Anil Ambani, and this was used to buy land in Nagpur. The Wire pointed out that it was Mr Trappier who had claimed that his company chose Reliance only because it already had land in Nagpur next to an airport. "The CEO is lying, the big question is why a company would invest Rs. 284 crore in a loss-making company with a valuation of Rs. 8.3 lakh. This is called kick-back. This is the first instalment of the kick-back that was given to Anil Ambani by Dassault," the Congress president alleged, saying that "Rafale is an open-and-shut case". Mr Trappier told ANI that Dassault was earlier in discussions with several other companies for offset tie-ups. "Obviously, we could have gone to Tata or other family groups. At that time, the decision to go ahead was not given to Dassault. We were in 2011, Tata was also discussing with other flying companies. We finally decided to go ahead with Reliance as they have experience in big engineering facilities." The Congress dubbed the CEO's detailed clarification as "Dictated Interviews and Manufactured Lies" in a tweet. Union Minister Rajyavardhan Rathore said: "Dassault CEO Eric Trappier clinically demolishes Rahul Gandhi's lies on #Rafale in this tell-all interview."